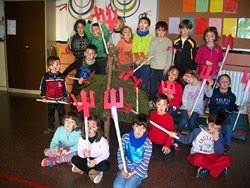 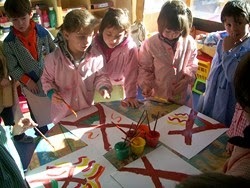 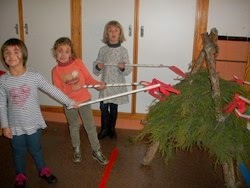 DURANT EL MES DE GENER AL NOSTRE POBLE ES CELEBRA SANT ANTONI I COM NO POTSER UN ALTRA MANERA A L'ESCOLA TAMBÉ. 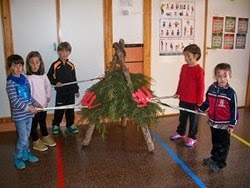 DAVID ENS HA PORTAT UNA FOGUERA I EL DIVENDRES DE SANT ANTONI VAN FER LA FORCA I ENS VAM PINTAR DE DIMONIS PER CREMAR LA FOGUERA. 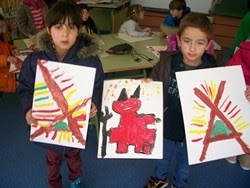 SÓN MOLTES MÉS LES ACTIVITATS QUE HEM FET AL RACÓ DE PLÀSTICA HEM PINTAT LA FOGUERA I EL DIMONI.